Steve Jobs' final gift to us all will be implemented in coming years by the company he helped found. Take a look at this artist's concept of an amazing new device - an Idea Accelerator! 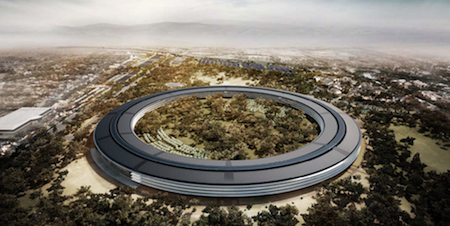 The new device is 1,522 feet in diameter, and will contain over 2.8 million square feet of space for up to 13,000 employees. Ideas can be initiated at any point in the structure; efficient management and years of tradition will cause product prototypes to circulate quickly around the device's 4,900 foot circumference and become simpler, slimmer and more efficient. Finally, once an idea has achieved escape velocity, it will be released as a new product. 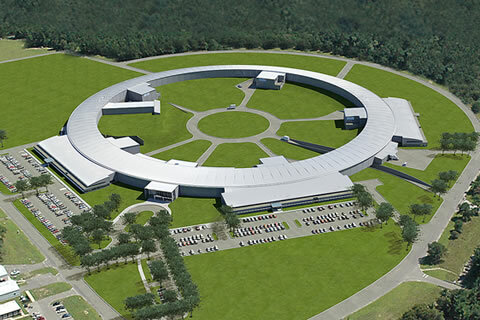 I hope readers will forgive me for comparing the proposed Apple Campus 2 plans, which have been updated by the company and presented to the city of Cupertino for consideration, to circular particle accelerators like the 3 Gev electron storage ring at the National Synchrotron Light Source II (NSLS-II) shown below (which will have a circumference of about 2500 feet). Via iPhone in Canada and MacObserver.